TGIF! Can you believe it's the last day of August and Labor Day weekend already. It seems like August just started! Time sure flies as you get older. Here are some of the best samples, freebies and offers Mommysavers has to bring you this week. Be sure to check out our Samples, Freebies and Offers forum for even more great deals. 1. 10 NEW Free Android App You can get FREE Android Apps such as Hello Kitty, One Direction, Pet Dinosaur and more. 2. Free Bear Naked Cereal Sample Yummy! Gotta love FREE cereal samples. 3. 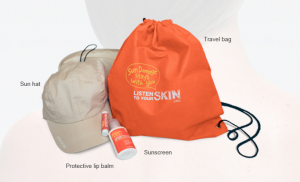 Free Suncare Kit Take care of your skin with this FREE suncare kit that includes a hat, sunscreen, lip balm and a travel bag. 4. Free Phone Call from Your Child's Favorite Disney Character What a fun way to surprise your child! Sign up now for a FREE Disney character phone call. 5. Free Chili's Appetizer or Dessert 'LIKE' Chili's Facebook App and get a FREE yummy dessert or appetizer. 6. Free Beauty Samples from Organic Spa Magazine Pamper your skin with these great FREE beauty samples. 7. Free Subscription to Whole Living Magazine Learn all about the latest healthy recipes, fitness and more with this FREE Whole Living magazine subscription. 8. Free In Stores There are some great freebies using coupons with in-store sales at stores like Walmart, Target and Walgreens this week. Head over to our What’s Free In Stores page to check them out. 9. Free Arby's Hot Turkey Roaster Sandwich on September 6th Choose from Turkey Classic, Turkey 'n Cheddar Classic, or Grand Turkey Club, no purchase is required to get this FREE sandwich. 10. Free Lansinoh Baby Product Samples Pick from these FREE samples: Lanolin, nursing pads, storage bags or baby wipes.